Adrien Broner (32-2, 24 KO) dispatched of Ashley Theophane (39-7-1, 11 KO) inside nine rounds, finishing off Theophane with a right uppercut, overhand right, and an accidental left hook to the groin which mistakenly was not ruled a low blow. Instead, the referee ended the fight thinking that Theophane was hurt and defenseless as Theophane waved his hand in the air to signal that he was fouled. Broner was bigger, stronger, and faster than Theophane. He bullied Theophane as he formerly did to competitors as a lightweight. 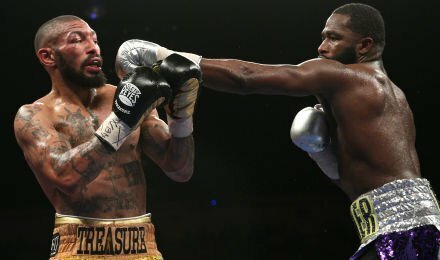 Here I will divert from the typical round-by-round report and stick to an exclusive assessment of Adrien Broner for several reasons: (1) it lacked appeal due to a string of bad performances by both fighters; (2) Broner has rid himself of the shackles of Floyd Mayweather “fanboydome” - which is a good thing as I will get to; (3) Broner has announced that he will once again compete at welterweight as he cannot shrink himself down to 140 pounds. I begin with Adrien Broner's loss of infatuation with Floyd Mayweather. Frankly, it appears that Mayweather's fondness of Broner was grounded in his own self-admiration. Flattered was he that Broner imitated him in every respect, and from an outsider's perspective seemed to ignore that it was a hindrance to Broner. Let us lay to rest some of the myth of Floyd Mayweather's multidivision dominance. Starting as a super-featherweight, Mayweather's 68-inch height and 72-inch were advantages that he retained even as he ascended as high as junior-middleweight. With fast hands and feet, he also had the benefit of facing many slower, less technical, flat-footed opponents – that is, his opponent selection was favorable. Mayweather's mastery cannot be denied, but his physical advantages must also be acknowledged. By contrast, Broner is short and stocky, is more effective applying pressure than keeping at length. Whereas Mayweather's signature is the straight right hand, which integrates well with the shoulder roll, Broner truly favors his left hook. Perhaps the half-guard pose has conditioned Broner to move his head less relying on his hooking side to deflect blows rather than utilizing head movement to slip punches, keeping his left side free for hooking. And much like Miguel Cotto, there is no seamless transition between offense and defense because one inhibits the other. In recent history, Broner did not effectively use the half-guard, shoulder roll defense where it would have benefited him most, against Shawn Porter. It would have walked Porter into straight right hands and right uppercuts, as was the case with Theophane. In close, it would have made his head and body a smaller target, a la Mayweather-Maidana I. But why not use it when it was needed? Because he was never comfortable with it and gave himself extra liberty based on the lack of perceived threat of his opposition? As a welterweight, the wrap is that his volume is too low, that any high-volume puncher should be favored to defeat Broner. While this is correct, that does not also mean that he should resort to high punch outputs. Rather, his lack of foot and head movement and countering invites high work rates from his opponents. Back to the half-guard stance: by design, the lead hand will become less active – less jabs, less hooks – with a natural inclination to roll and counter with the right hand. This is what allowed Paul Malignaggi to have a high work rate against Broner, who did not transition to it for defense, but approached with it to begin his offense. The world is complex for Adrien Broner and has been made more challenging by his inability to keep his weight down. By this I mean that at 140 pounds and below, the imitation of Floyd Mayweather has inhibited Broner's offensive prowess at weight classes where his physical strength and power should have predominated. His increasing size now means that he needs to rapidly accommodate himself to fighting larger men while he has not slowly developed the ability to counter and move to reduce their punch outputs. Mayweather honed his countering skills from the beginning with the Michigan-style defense learned from his father.